Readers Question: 1. I read somewhere that accommodative monetary policy (in other words, quantitative easing) does not automatically result in higher inflation. For higher inflation to occur, the output gap must be crossed. i.e. idle factories back in business, unemployment rates down, etc. However, I don’t think the hyperinflation in Zimbabwe was preceded by increasing productivity or employment. Can you please explain this concept? 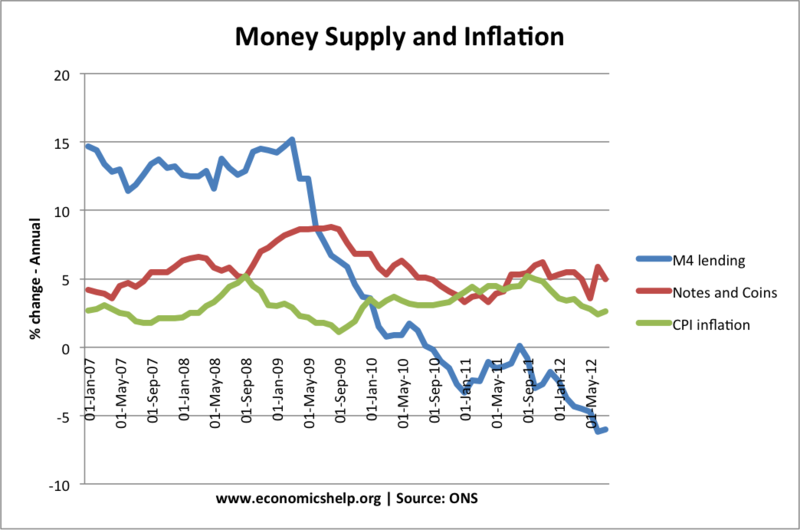 Increasing money supply through quantitative easing, doesn’t necessarily cause inflation. This is because in a recession, people want to save, so don’t use the increase in monetary base. 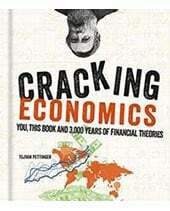 If the economy is close to full capacity, increasing money supply will invariable cause inflation. Hyperinflation in Zimbabwe was caused by the decision to print more money. The hyperinflation and uncertainty in economy caused lower output. Also, in Zimbabwe, the scale of printing money was much greater than our modest efforts at quantitative easing. 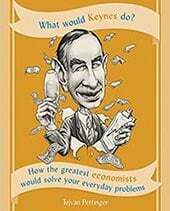 Even in a recession and liquidity trap, we could cause inflation if we really wanted to. If the Central Bank literally doubled the amount of cash in the economy, it would see prices go up. It is also a question of scale. For example, quantitative easing involves the Central Bank purchasing bonds from commercial banks. By selling bonds, the commercial banks see an increases in their cash balances. If the economy was growing strongly, they would have confidence to lend these extra bank balances out to firms. This could cause inflation if demand grew faster than supply. However, in a recession, when there is spare capacity and lower output, banks will not want to lend these extra money deposits. Firms will also be reluctant to borrow because they are not optimistic about the future. Therefore, although the Central Bank increases the monetary base, this is basically saved rather than spent. Therefore, there is little inflationary pressure. – At least whilst economy remains in recession and liquidity trap. Data from the US shows you can increase monetary base but have little or no inflation. 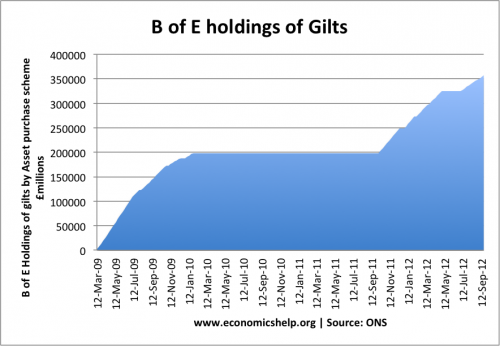 The Bank of England were authorised to create £375bn of new money to buy gilts. This aimed to reduce long-term interest rates and boost the money supply. 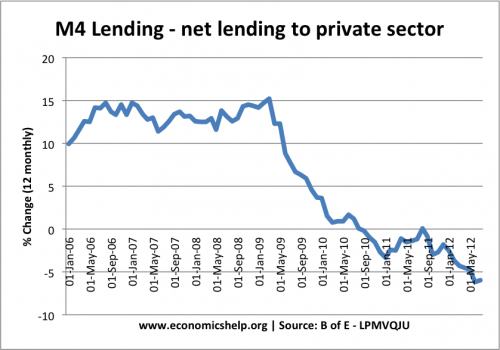 But, M4 and M4 lending fell, despite quantitative easing. 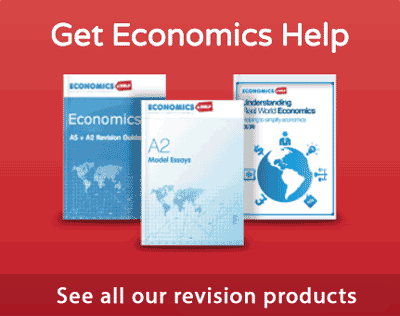 To confuse matters, inflation may occur due to factors other than quantitative easing. For example, in 2011, the UK experienced cost push inflation caused by rising taxes, rising oil prices and the impact of devaluation. But, this rise in CPI inflation proved temporary. With the case of Zimbabwe, the hyperinflation was caused by a decision of the government to print more money. They printed more money to deal with their growing budget deficit. The government needed to pay public sector workers pay increases and it didn’t have sufficient funds so the Mugabe government made the Central Bank print more money. This rapid increase in the amount of Zimbabwean currency led to rising prices. To control inflation, the government tried to set fixed prices, but this was unpractical for traders and actually led to a decline in output. (there was no incentive to produce for the fixed prices). Therefore, you had a situation of more Zimbabwean currency being printed to meet a falling output. This combination led to inflation. The difference is that Zimbabwe was printing money at a rate well above their own inflation rate, so this always caused more inflation. 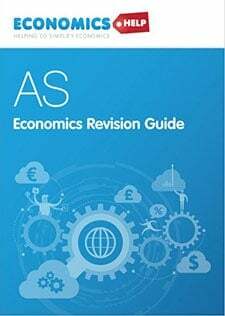 With quantitative easing, the Central Banks were increasing monetary base in a controlled way which only led to a moderate increase in lending because of the state of the economy. ← US Money Supply and Delayed Inflation? It’s a bit misleading to suggest that ordinary “people” find their bank balances boosted as a result of QE. The vast bulk of those holding government debt are wealthy individuals, banks, pension funds, and other institutions. Wealthy individuals do not change their weekly spending habits much in reaction to increases or decreases in their net wealth or income. And institutions like pension funds do not rush out and buy consumer goods in reaction to QE (though doubtless they try to buy alternative assets, hence the stock market appreciation). I.e. I suggest the muted effect of QE has more to do with the nature of the recipients of “QE cash”, than with anything to do with ordinary people. 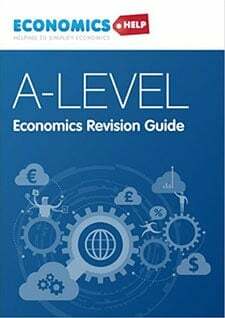 Second, re the extra cash that banks find themselves holding as a result of QE, I don’t agree with the claim that “If the economy was growing strongly, they would have confidence to lend these extra bank balances out to firms.” My reason is that commercial banks lend when they see viable lending opportunities. What they have in reserve is irrelevant. And I’m not even sure that changing Gilts into cash effects their reserves, as Gilts count as reserves, don’t they? (But I’m not sure about that one). Thanks Ralph, it’s a good point about the recipients of QE. A great article but could be sharper. The writer is playing with words when he says hyperinflation happens in Zimbabwe because its central bank prints money whereas QE by contrast “expands the money supply”. The two may have different processes but in essence they are the same. Zimbabwe government can also issue bonds to plug its budget deficit, let some supposedly independent third parties by the b0nds and then the central bank will buy the bonds in supposedly “secondary market”. Voila, budget deficit solved and there is “no money printing”. The correct answer is the writer’s second point about the SCALE of the money printing.